Next Flowers is an online florist in the UK. Fresh flower bouquets and gift cards delivered next day. – Most fresh flower orders placed Monday to Friday before 8pm can be delivered the next day. Most orders made on Saturday before 12pm and Sunday before 12pm can be delivered next day. No deliveries are made on Bank Holidays or the day following a Bank Holiday. Deliveries are made Monday – Sunday between 7am and 7pm (except Bank Holidays). Delivery times cannot be guaranteed. Delivery is generally to mainland UK postcodes only, excluding Northern Ireland. No deliveries are made on Bank Holidays or the day following a Bank Holiday. 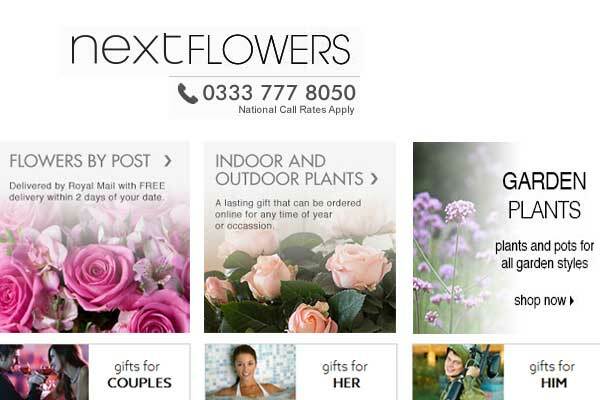 – Postal flowers delivered free of charge, within 2 days of your specified date.